Our assignment was to write about a difficult conversation we had had and to give some pointers on what makes for a good conversation. So, here is a personal instance from last month. Verbal communication is both one of the most amazing miracles and the most trying tasks of human interaction. When you think about it, is astounding to think that we can take something like sound waves, form them into words such that certain combinations of um’s and ah’s represent certain objects and ideas, and then mix and match all these sound wave patterns into speeches and conversations that can inspire such emotions in other humans as to change the course of history! That long sentence of an awed rant being over, there is that one point still left that can cause complications: words can inspire strong emotions in people — both positive and negative. An instance of this in my life happened earlier this month when two of my younger sisters and I were working on a birthday present for my brother. He had made my Dad and I Power Points as presents (I know it sounds nerdy, but they are really personal and sweet! 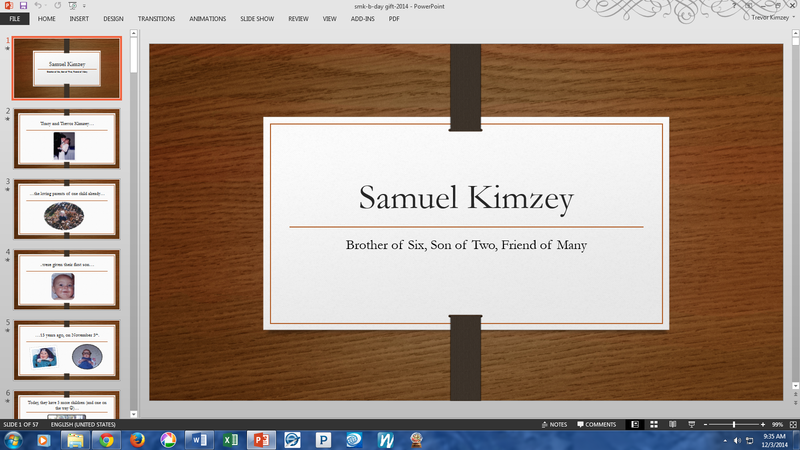 ), and after my birthday, I had this great idea to make Sam one for his birthday in November. I told Laura and Abby about it, and they got excited, too. We divvied up jobs with the understanding that the others were allowed to give their input. Laura was in charge of writing the words for the slides (she’s good at coming up with touching words that I would feel awkward writing), Abby was in charge of finding pictures (she loves poking through photos on Picasa), and my job was to find music for the presentation and get the slideshow timing lined up. Early on, I made a playlist on Grooveshark of several songs we could use (mainly pieces from Lord of the Rings and Star Wars), and then I got busy with schoolwork and did not get time to do much else with the project. Laura and Abby spent hours goofing off together, putting in pictures and exploring the realm of slide transitions. It was the night before Sam’s birthday when I was going through the Power Point with the girls, making some last-minute corrections. We got to the silly credit slides at the end where Abby had put some lovely pictures of flowers. These immediately struck me as out of place in this presentation for our soon-to-be-fifteen brother. When I told her, Abby flared up and retorted that I was ruining all her work. My pride was hurt, and I yelled back at her, trying to explain my perfectly good reasons why she was wrong (Note: Don’t try to reason when you’re angry — especially with your angry 10-year-old sister). Our ‘conversation’ quickly escalated to the point where Mom and Dad intervened, trying to bring some sense to our dispute. Many hot tears were shed and Kleenexes wadded up before our high-strung emotions were brought to a rational level. Our fight was not so much about the pictures, of course. I felt like my project was being taken over; Abby felt like, after all my indifference to the project, I was just barging in and ruining all her hard work. In the end, we were able to see our mistakes, apologize, work it all out, and go to bed at 10:30 jumping up and down with excitement at how the Power Point had turned out, but I had learned a key to conversation: It takes both humility and effort to look at a situation, not only from your own narrow, selfish perspective, but from someone else’s point of view. Wow, I really appreciate your honesty! I also have two younger sisters (as well as a younger brother), and I agree that sometimes it is difficult to be humble and look at things from their point of view (especially when in the moment it seems your way *must* be right :)). Definitely something I’ve experienced before! Great post –I really resonated with it. Ah, yes. “Death and life are in the power of the tongue” as that verse goes. Fortunately this case wasn’t as drastic as that, XP but arguments are certainly never good. That’s really cool how you guys were making your brother a Power Point as a present. I’ll bet he really liked it. 🙂 Really good conclusion at the end. It’s very easy to become biased and attached to one perspective, but usually there’s merit to both sides of the question.